Family history correspondence has been one of the most useful things that I have done in my genealogical journey. If you can find family members that have an interest in family history, it really pays to write them a query. I wrote last week of my correspondence with my cousin, Margaret Arthur of Ocala, Florida and the discoveries related to photos in my family albums. 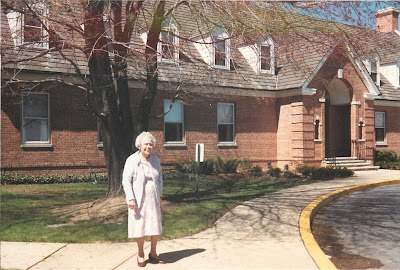 Aline Cavanagh Mayne 1902-1995, the saint of my family history. This summer has been very busy for us. I went to Ottawa, Canada in the first part of July and was there for the Canada Day celebrations. The Queen was there and I watched her from less than ten feet away as she reviewed the troops in front of the Parliament Buildings. It was an emotional time because the Canadians are experiencing such strife due to the Quebec separatist movement. The Queen put out a plea for unity but I think it fell on deaf ears in Quebec. Ottawa was a beautiful city. I rented a bicycle and explored the landmarks and the bike paths along the many waterways . While I was there I did some research on my wife's side of the family, the Fitzpatricks. Turns out that they were American loyalists who emigrated to Canada after the Revolutionary war. They settled along the St. Lawrence River near a town called Cornwall. Her great grandfather moved to Colorado and homesteaded some land on the western slope of the Rockies and founded the town of Collbran, Colorado. Please fill out as much as you can recall. Don't worry if you don't have answers. I would prefer that you just say that you don't know and return this sheet as soon as possible. 1. What were the names of your father's brothers and sisters? 2. What were the names of your mother's siblings? 3. Do you recall the names of your great grandparents? 4. Did your grandfather have a brother named Daniel? 5. If so was he married to a woman named Alice? 6. Please write down the names of any of your cousins? 7. How were these cousins related? 8. Please write down addresses for any living relatives. 9. Do you know where any of the relatives above are buried? It was good to hear from you. I was so sorry to have lost contact with your mother [Jill Mayne 1935-2005] for so long. I will be glad to help you find information on the Mayne family. I can recall many things that might be helpful. I never saw my grandparents Mayne who lived in Frederick, Maryland but I do remember when my father [Rev. Joseph Hanson Mayne 1849-1938] went to the funeral of his father [David Mayne 1921-1910]. I must have been 8 or 10 at the time [Aline was born in 1902]. Frank had raised fruit and vegetables for the Baltimore market. Had no children- collected rocking chairs, left most of his considerable fortune to the United Brethren church in Frederick. 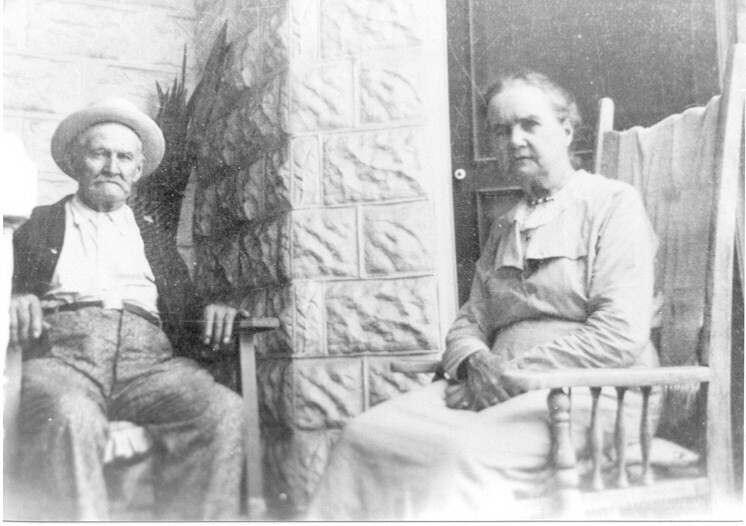 Uncle Frank and Aunt Fannie Mayne on the porch of their house at 237 Dill Avenue, in Frederick, Maryland. This picture was probably taken by Aline Mayne Cavanagh or her husband, Elvin Cavanagh in the 1930s. They appear to be using part of their rocking chair collection. Thanks for your letter of 10 October. The U.S. Mail is a wonderful thing but letter writing seems to be a lost art. I love to write now but resisted for so long. My computer has been an aid in that regard. I hope you don't mind the typed format. My genealogy instructor suggests that we write all our letters to relatives by hand. My hand can't keep up with my mind though. Not that I am lightning fast at the key board but I it is still much faster than hand written. My letter writing style says a lot about me as a person. I like to do everything the fastest and easiest way possible. As far as your hand writing is concerned, I think you are too modest. The arthritis is not apparent to me. You have lovely handwriting, very readable. Do you correspond with others? I am sure they will agree with me. If it is uncomfortable for you to write at times you might consider sending me a tape recording. Do you have a cassette tape recorder? I will send you some tapes if you would like. I have enclosed a copy of your father's list of church appointments. I don't recognize the names of all the churches or charges so if you could give me the names of the towns it would help me in tracking any records in the individual church archives. I think your father was a fascinating fellow and I would like to write his biography. The civil war stories would be very compelling if you can remember any more details. Despite all the trappings of progress, the American people are still very much the way they were. Instead of soldiers foraging for food in the countryside, it is the homeless foraging for food in city alleys. I have enclosed a guideline on how to record your personal history. It says "oral" history but that is strictly optional. If you prefer to write it down that would be just as good. There are lots of questions on these sheets, so don't get overwhelmed. The main reason for so many questions is to show you that there are many interesting things that have happened in your life. I think you are a very unique and talented woman. God has blessed you with many gifts in your life. I ask that you share those by writing or recording your personal history. Our church is celebrating All Saints Day by placing pictures of the saints in our lives on the altar. Our pastor spoke about her father who was an excellent example of service and devotion in her life. She asked me to speak last Sunday about the research I have been doing on our family history and to discuss one of our family saints. I immediately thought of your father and had resolved to talk about his long years of service to the church. When I started to organize my thoughts about him and about my love of genealogy, I realized that the person I most wanted to recognize was you. I began looking through the accumulation of letters, notes and pictures that you had saved, and realized what a tremendous service you had done for the family in preserving those mementos of the past. Your pictures are on the altar now. After my talk I had one of the parishioners come up and say "hi, cousin". His name is Jim Wolfenden and he is a descendant of the Mayne family too! He talked about his brother attending some of the Mayne Family reunions in Frederick. Well anyway, I hope you will consider writing down some of your memories. Even just a few pages would be appreciated. ... We lived at Lockington [Ohio] at the time of the famous Dayton flood. Fortunately we lived high above the river so we were not affected by it as we watched houses and trees etc. float down the river. David [her brother] was in Dayton working at National Cash Register Company earning money for college. He found refuge on the top of the Railway Depot. Canned goods i.e. tomatoes, applesauce, etc. floated by so the folks grabbed them and lived on them until the water subsided. I hope these little excerpts will inspire you to write down some of your own memories and share them with your family. When your memory is exhausted, start writing letters or emails to your family members and genealogical cousins to explore their collection of family memories and heirlooms. Scan your old letters and photos and attach them to ancestor profiles in your online family trees. If you would like to read the entire series of letters between me and Aline, you can download a copy at this hyperlink. Thank you for recognizing the post. It was heart felt.